Though video production software isn’t generally thought of as a business tool, in today’s video-centric advertising, training, and general communications environment, it should be. Apparently, as evidenced by the release of their simple-to-use, but effective Reveal 11 Business automated video production software, Muvee Technologies feels that way as well. 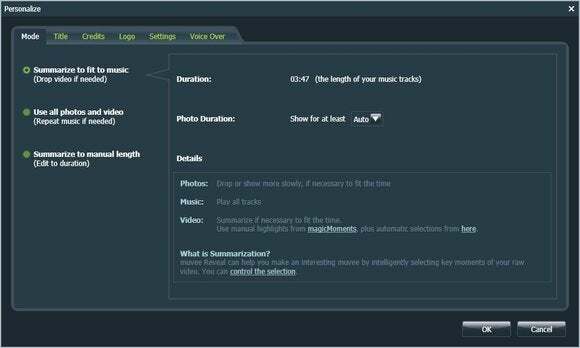 With Reveal, basically all you do is provide the pictures, video, and text; arrange their sequence; pick a style template; and let the program process it into a complete production. Beyond that—butter. The number of style templates, which contain the background music, FX and transitions melded into a “look and feel” are what differentiate the regular $80 version of Reveal 11 and the $500 Business SKU. The regular version has only a few styles, while the business version has over 40, plus 2000 musical renditions that you may use royalty-free. Functionally, both versions are identical. Additional control over the creation process is hidden in well-constructed dialogs with precise and effective terminology. Reveal 11 business is supremely easy to use. There’s a content row on the top, with style-selection and preview panes beneath that. That’s it visually, but there’s more control over the video production than is apparent at first glance. 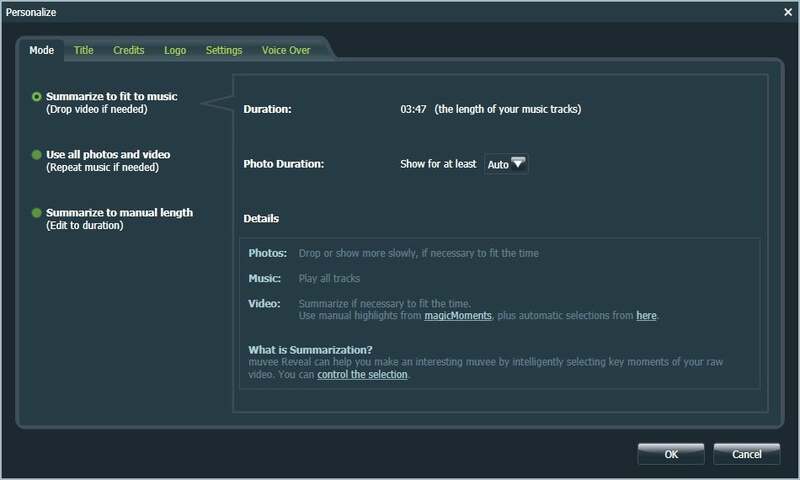 Click on Personalize in the bottom left corner and you can insert your logo, adjust the scene timing, define the titling and credits, and record a voice-over. There’s also a small audio mix console. 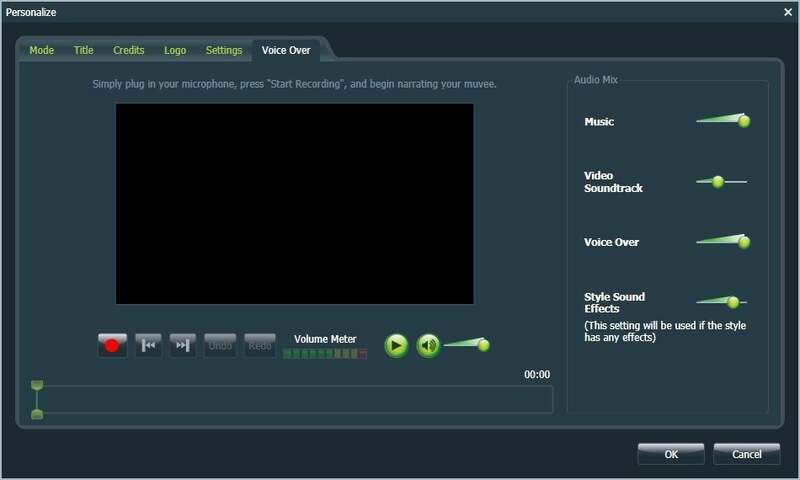 Click on any picture or video in the media bay, and you’re presented with slick and simple editing controls such as a zoom effect control for photos and a highly accurate scene detector/slicer for videos. There are also controls attached to each style for color profiles, more scene change speed, camera wonkiness, and more. Reveal 11 provides complete, yet simple voice-over and audio mixing capabilities. Just bring your microphone. Even better; labels and messages are concise, yet not overly terse as with that vast majority of programs. They actually tell you what to do. Additionally, there’s not one cluttered area, overcrowded toolbar, or cryptic icon in sight. Interfaces simply don’t get any better. I never once cracked the help file. I’m not trying to step on the toes of professional videographers -- a good one is worth their weight in gold. But many of us don’t have the gold, and Reveal 11 Business largely meets the need. If not for a professional advertising campaign, just about everything else. If you’re really strapped for cash, you can always buy the regular version and shop for a $10/$15 style that suits you in the Muvee store. There’s also a music store with affordable licensing fees based on your intended usage. Muvee's Reveal 11 Business video producer could be just the tool you need to professional quality promotional or training videos.